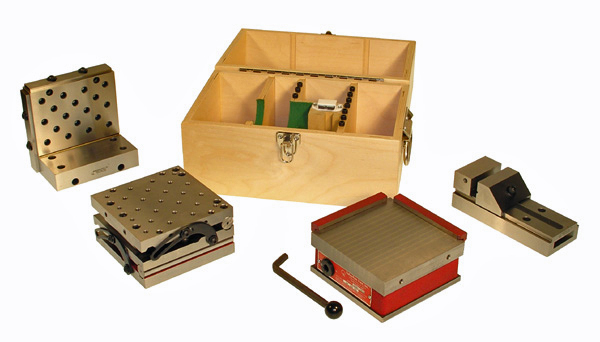 COMPLETE SineSets by Suburban Tool, Inc.
A complete matched system of bolt-together precision tools in a beautiful, fitted, wooden storage case, at a significant savings. Each set includes a SineSet® sine plate or compound sine plate, a max-C-mag™ magnetic chuck, a vise and an angle plate. The SS-0 sets also include a v-block. Each set comes with all necessary locking straps, rails, handles, bolts, screws & washers, as well as the proper T-handle hex wrench. Sets designated with a number ending in 'F' include a fine pole magnetic chuck. Each of these SineSet® tools & many others, as well as the storage cases, can be purchased separately.